Non-Destructive Testing - Metallurgical Technologies, Inc. Magnetic particle Inspection (MPI) is a non-destructive testing (NDT) process for detecting surface and shallow subsurface discontinuities in ferromagnetic materials. The process puts a magnetic field into the part. To identify a leak, ferrous particles, either dry or in a wet suspension, are applied to a part. These particles are attracted to any areas where there is a break in the magnetic field and form what is known as an indication. The magnetic particle indication is then evaluated to determine its cause. Magnetic Particle inspection is a commonly used for non-destructive testing “NDT” to identify cracks, seam, voids or material flaws. Various types of liquid penetrant testing methods are utilized to detect material defects open to the surface or to detect open surface cracks. Red dye or fluorescent penetrants are utilized as well as various types of wet and dry developers. 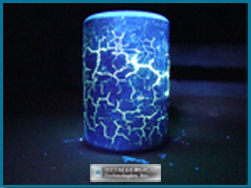 Fluorescent dye penetrant examinations are performed under black light conditions to ensure the highest detectability for very fine fatigue cracks. Liquid Penetrant Testing if a tyep of non-destructive testing. Close-up views of fluorescent magnetic particle and dye penetrant indications under black lighting. Left: A fluorescent Magnetic Particle indication at the gear tooth root. 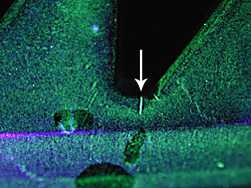 Right: Transverse fatigue cracks in a rear end gear identified using fluorescent Liquid Penetrant Testing. A Scanning Electron Microscope equipped with an EDS provides chemical compositional micro-analysis of the field of view or spot analysis of minute particles. This type of Non-destructive testing can detect over 90 different elements with our low-atomic number detector. This NDT test can be performed on small to microscopic samples. EDS can be utilized to determine the chemical composition of corrosion, foreign particles, staining, materiel composition and much more. This micro-analysis is also a non-destructive test. Field metallographic replication is a non-destructive test required in some applications where it is not possible to remove a component from service, or the size prohibits analysis in the lab. Various replicating medias allows MTi to create a portable copy of the microstructure of interest. Replication involves removal of the surface of the material by grinding, followed by a succession of polishing using fine grits. Once the surface is scratch free and has a mirror finish, the surface is then etched with various acids to reveal the metallographic features. Once the replication media is cured, the replication will be removed from the sample and analyzed on either a metallograph or Scanning Electron Microscope.